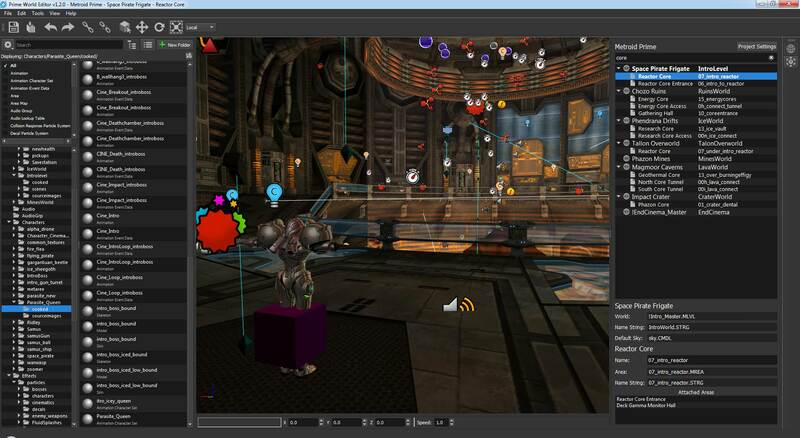 Prime World Editor is an editor for the Metroid Prime series and Donkey Kong Country Returns! I've been developing it for nearly two years now and it's finally feature-complete enough to release! The editor is able to open, view, and edit any level from Metroid Prime, Metroid Prime 2: Echoes, Metroid Prime 3: Corruption, Donkey Kong Country Returns, and all known/publicly available demos and prototypes of those games. Editing is currently limited to room script layers. This means you can spawn new objects, edit object properties, set up links to other properties, and save/repack the level so that the game can reload it. There's no support for viewing or editing most asset types. Most other area components, such as room geometry, collision, dynamic lights, etc. can be viewed but not edited. The editor does not handle moving assets around between paks. You'll need to either stick with assets that are already in them, or add them yourself by putting them in the folder and adding them to PakTool's .txt list file. There is some functionality for importing/editing models and textures, but it's VERY limited and I don't really recommend actually using it. Models import with no materials, while textures are required to be a DXT1 DDS with no mipmaps. There's an editing interface for model materials, but there's no way to add/delete pass types, so you're stuck modifying the ones that are already there. If you try to move assets between rooms, you will probably experience hitching ingame when the room loads. Objects that rely on data being saved to the save file, such as Memory Relay, won't work correctly ingame. Objects in MP2/3/DKCR that use .rel and .rso files won't be able to be moved into rooms that they aren't normally in. A few interface components (such as the starting window, the model editor, etc) are kinda clunky and will be redone eventually. Check the readme for a more complete list of features, limitations and issues. From this point on I'll be using this thread to post any updates on editor development and future releases. I'm hoping to be able to gradually add new features and do more frequent, smaller releases as new things get implemented. Feel free to post if you have any feedback or questions about using the editor or modding any of the supported games! [center][b][size=32][url=https://github.com/arukibree/PrimeWorldEditor/releases/tag/v1.2.3]Prime World Editor v1.2.3[/url][/size][/b] [center][b][size=24][url=https://github.com/arukibree/primeworldeditor]Source[/url][/size][/b][/center] [img]http://i.imgur.com/vblrdos.jpg[/img][/center] Prime World Editor is an editor for the Metroid Prime series and Donkey Kong Country Returns! I've been developing it for nearly two years now and it's finally feature-complete enough to release! Here's some quick bullet points on the current featureset and its limitations: [list][li]The editor is able to open, view, and edit any level from Metroid Prime, Metroid Prime 2: Echoes, Metroid Prime 3: Corruption, Donkey Kong Country Returns, and all known/publicly available demos and prototypes of those games. [/li] [li] Editing is currently limited to room script layers. This means you can spawn new objects, edit object properties, set up links to other properties, and save/repack the level so that the game can reload it. There's no support for viewing or editing most asset types. Most other area components, such as room geometry, collision, dynamic lights, etc. can be viewed but not edited. [/li] [li] The editor does not handle moving assets around between paks. You'll need to either stick with assets that are already in them, or add them yourself by putting them in the folder and adding them to PakTool's .txt list file. [/li] [li] There is some functionality for importing/editing models and textures, but it's VERY limited and I don't really recommend actually using it. Models import with no materials, while textures are required to be a DXT1 DDS with no mipmaps. There's an editing interface for model materials, but there's no way to add/delete pass types, so you're stuck modifying the ones that are already there. [/li] [li] This build doesn't touch the MLVL and SAVW formats, which means there are a lot of limitations on what you can do: [list][li]If you try to move assets between rooms, you will probably experience hitching ingame when the room loads. [/li] [li]Objects that rely on data being saved to the save file, such as Memory Relay, won't work correctly ingame. [/li] [li]Objects in MP2/3/DKCR that use .rel and .rso files won't be able to be moved into rooms that they aren't normally in. [/li][/list][/li] [li] A few interface components (such as the starting window, the model editor, etc) are kinda clunky and will be redone eventually. [/li][/list] Check the readme for a more complete list of features, limitations and issues. From this point on I'll be using this thread to post any updates on editor development and future releases. I'm hoping to be able to gradually add new features and do more frequent, smaller releases as new things get implemented. Feel free to post if you have any feedback or questions about using the editor or modding any of the supported games! the new time-eating pasttime begins! For anyone who's already downloaded, I just updated the readme with some info on camera controls and keyboard shortcuts. So I'm having a bit of a problem. every time I try to extract from one of the paks the program crashes. It'll extract fine until it finishes, then it'll stop responding and I have to force quit the program. However I am also using files that were dumped by the randomizer program, would that be causing the problem? Someone on Met Const reported this issue as well and I think I've fixed it. Try downloading PWE again from the same link in the first post and try it again. lol I was completely baffled by that post. Two years is a crazy length of time to be developing anything, congrats on the v1. lol I was completely baffled by that post. Two years is a crazy length of time to be developing anything, congrats on the v1. Yeah, but now he can get his desired job at Retro and work on.................. not Metroid Pime. Did I actually post in the wrong forum? Ha, that's what I get for doing that at 5 in the morning I guess. Don't suppose there's a way to delete posts is there? Anyways, I'll try redownloading later today and let you know how that turns out parax, thanks for checking it out if nothing else. Did I actually post in the wrong forum? Ha, that's what I get for doing that at 5 in the morning I guess. Don't suppose there's a way to delete posts is there? Anyways, I'll try redownloading later today and let you know how that turns out parax, thanks for checking it out if nothing else. I cleaned up that post now I know it was definitely in the wrong place. Regarding the crash, it might be an idea to have it write a log file as it goes, or you could have it bring up a console and print to that. There's a win32 API call that will start a console from a GUI app but I don't remember the name offhand. I cleaned up that post now I know it was definitely in the wrong place. Regarding the crash, it might be an idea to have it write a log file as it goes, or you could have it bring up a console and print to that. There's a win32 API call that will start a console from a GUI app but I don't remember the name offhand. i'm using Windows 7 64 bit. maybe that could help narrowing down things. edit: lol, it works without crashing now. i didn't do anything and now the program doesn't crash. this is mp2-tier shenanigans. i also get the crash. since the pak dump actually works, i just moved along but the crash makes things a bit clunky. must be something that is in parax's computer but not in the others (or the opposite) i'm using Windows 7 64 bit. maybe that could help narrowing down things. edit: lol, it works without crashing now. i didn't do anything and now the program doesn't crash. this is mp2-tier shenanigans. yeah I had a similar crash earlier yesterday that happened after repacking, and that's basically how I fixed it. Nobody reported this extraction issue before I released, though. In any case, it sounds like Miles is getting the extraction crash now so I'll work it out with him and hopefully figure it out. [quote="DJGrenola"]Regarding the crash, it might be an idea to have it write a log file as it goes, or you could have it bring up a console and print to that. There's a win32 API call that will start a console from a GUI app but I don't remember the name offhand. [/quote] yeah I had a similar crash earlier yesterday that happened after repacking, and that's basically how I fixed it. Nobody reported this extraction issue before I released, though. In any case, it sounds like Miles is getting the extraction crash now so I'll work it out with him and hopefully figure it out. I don't see this updated readme with the camera controls. How do you rotate the camera? If you downloaded it earlier, try it again now. [quote="athairus"]I don't see this updated readme with the camera controls. How do you rotate the camera? [/quote] If you downloaded it earlier, try it again now. Hard to be 100% sure since I never had the problem and I don't have a whole lot of testers, but I'm pretty sure the crashing-on-extract problem is fixed now. every time i test my rebuilt iso after some editing, the game crashes why would that be? First you'll want to have the game files extracted by Dolphin itself... right click the game, go to Properties, then go to the Filesystem tab, right click Disc, and click Extract All Files. You'll also want to extract the dol and the apploader which are separate menu buttons. After that go to Options -> Configure -> Paths. Set DVD Root to point to the folder you extracted the files to, and set Apploader to point to the apploader you just extracted. Then go to Open and open the .dol file directly, and it should start the game with your extracted files. It extracts the game in a manner very similar to Dolphin, block by block with hash verification along the way. I would still recommend running the extracted files directly over any ISO tool, but yeah if nodtool works well then it's probably one of the better choices if you -do- want to rebuild an ISO. I'll get a windows build up later tonight for those that do. If you have any bugs or questions please report/ask them there. nodtool release post moved to URDE thread https://m2k2.taigaforum.com/post/urde.html If you have any bugs or questions please report/ask them there.